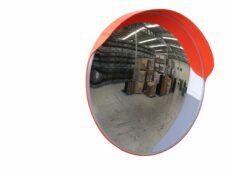 Our heavy duty convex mirror are built to last and proven to deal with the very harshest Australian weather conditions. 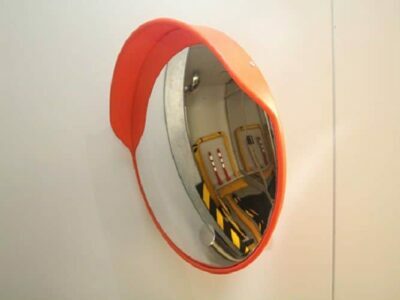 This convex mirror is built with Weatherproof fibreglass backing and acrylic face. This Convex Mirror comes included with both wall and pole mount brackets. Mirrors available in 300mm, 450mm, 600mm, 800mm and 1000mm. This 300mm Outdoor Convex Mirror is especially suited for use on bends or intersections where view is limited, showing the whole surrounding traffic situation clearly. The mirror is featured with high light transmittance, good image reflection and good shock resistance. The housing is made of orange PP material, with good corrosion resistance performance. The top of the housing has a small piece of convex baffle, which can keep the rain off, so images will still be clear on rainy days! We have 25+ years experience supplying quality Convex Mirrors throughout Australia. Please don’t hesitate to add this popular product to your shopping cart whilst stocks last.